On September 19, CLASP held the Philippines Room Air Conditioner Market Assessment: Preliminary Findings & Validation Meeting in Manila. CLASP is conducting a comprehensive characterization of the room air conditioners market in the Philippines, the first effort of its kind in the country. The analysis will contribute to energy efficiency policies and programs for ACs, implemented in support of the Philippines’ national energy efficiency targets, by evaluating the opportunities for and impacts of transitioning to high efficiency, low global warming potential room ACs. 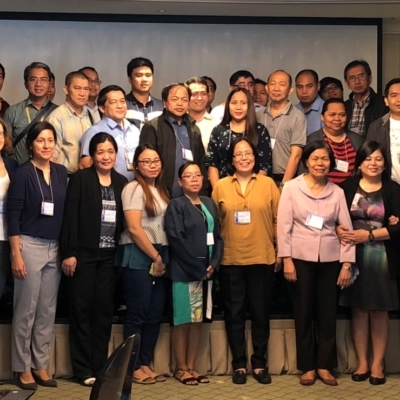 The meeting in Manila brought together 53 representatives from government agencies, the Philippines Appliance Industry Association and its members, and international organizations to discuss data needs and validate the initial market assessment findings. Government agencies represented included the Department of Energy (DOE) and its field offices, the Department of Industry and Trade, Philippine Ozone Desk, and the Department of Environment and Natural Resources. The Deutsche Gesellschaft für Internationale Zusammenarbeit (GIZ) and the ASEAN Subregional Environment Program also participated in the meeting. Industry representation was strong, with attendance by ten room AC (RAC) manufacturers and distributors: Concepcion-Carrier, Panasonic, TCL, Samsung, Haier, LG, Koppel, Daikin, Omni and Fabriano SpA. CLASP’s local partner, Innogy, shared some of the challenges in the data collection, which included extensive market research as well as visits to nearly 200 retail stores in Luzon, Visayas, and Mindanao islands groups. CLASP’s presentation of the results of our preliminary analysis of the market data proved interesting to participants, and some industry participants indicated their willingness to assist with future data collection. Building off of the preliminary market assessment findings, CLASP will conduct further analysis to quantify potential energy and greenhouse gas emissions savings from higher efficiency levels, and to estimate other potential benefits from revising the Philippines’ AC standards. The results of these activities will be included in a comprehensive market and policy options report, which will provide the DOE with technical evidence to support more stringent minimum energy performance standards for RACs. The Philippines RAC Market Assessment is a component of the Kigali Cooling Efficiency Program (K-CEP) in the Philippines, funded by Heising-Simons Foundation. To learn more about this program, read a summary of CLASP’s Cooling Program in Southeast Asia and visit our Southeast Asia webpage.